We have a fantastic range of Dovecraft wooden stamps, so pick your favourite and follow Maxine’s step by step tutorial on how to make your very own colouring page out of them. 1.Pick your Dovecraft wooden stamp design and with black ink, stamp your design onto a few separate post-it notes. Leave these to dry and then cut out. 2.Stamp your design across your A4 white card. To not overlap a stamp design with another, use the post it shape you have cut out to cover one of your stamps. Carefully stamp on top of your post it note and then peel back to reveal your design. 3.This technique will protect the design underneath from getting ruined. Continue in this fashion until your paper is covered. 4.Leave your stamp designs to dry and then choose the First Edition markers you’d like to colour in your designs with. Your page is now ready to fill with all sorts of bright colours! How simple is that? You can use Maxine’s tutorial for other stamp designs, we love this unicorn stamp, wouldn’t it make a fantastic colouring page! 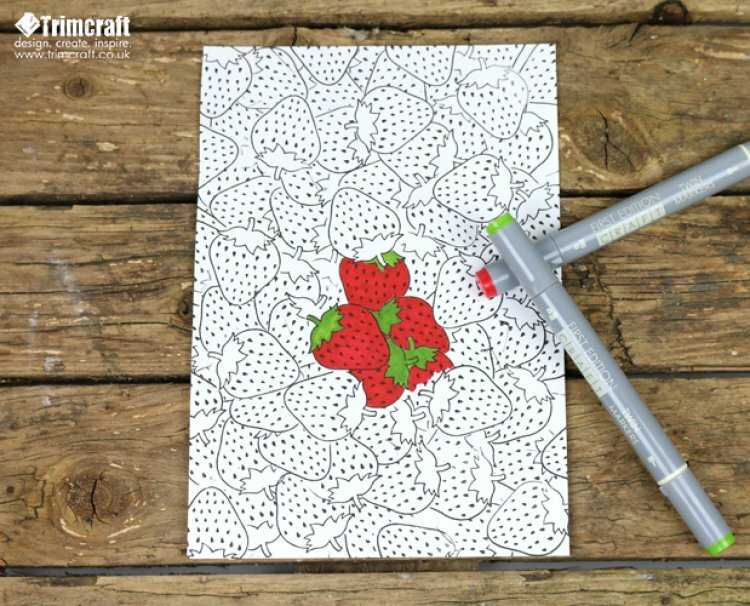 Make sure to upload your colouring pages to the project gallery and #trimcraft on social media so we can see your crafty projects there too!